L.A. Youth writers reviewed Lil Wayne, Alesana and Billy Boy on Poison. Helen, 18, learned a lot about Native American history in this wild story. Lia says this barbecue/dim sum place in San Gabriel is worth the drive for its high-quality, inexpensive food. Readers offer their thoughts and feelings about articles in the May -June 2008 issue of L.A. Youth. Essay contest winners chose a road of childhood memories, a curvy street and one with peacocks. Casey, 16, says it was cool volunteering as a poll worker. WITH INTERVIEWS ASKING TEENS ABOUT THE ELECTION. Mindy, 18, says it’s fast and free. Allison, 16, didn’t expect to have fun when she finally met her pen pal: a bug-catching, wrestling-loving, energetic kid. Mmmmm ... assorted, tasty baked goods. Every Saturday, when my mother and I go grocery shopping at one of the Chinese supermarkets in San Gabriel, we notice a large crowd of people clumped around Yum Cha Café. It’s not really a café, it’s a barbecue/dim sum (small appetizer plates)/noodle house/bakery take-out place, inside the store. My mother had always wanted to try it, so recently she made my dad and me go with her. The Yum Cha Café is really a set of three counters (one for noodles, one for barbecue, and one for dim sum and the bakery). There are typically about 40 people crowded around the dim sum and noodle counters. Standing in line is uncomfortable because everyone stands close together and you can feel people’s body heat, and the people are loud. You can hear customers calling out orders like “Yut go cha siu bao, (one order of barbecued pork buns)!” from 50 feet away. When I went with my family, the crowd scared my dad and me, so we let my mom order at the dim sum counter. 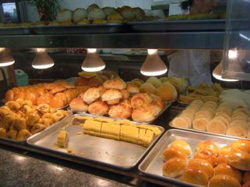 The dim sum portions are small, but depending on how much you like to eat, one order could make a light meal. She surprised us with turnip cake (99 cents for three), rice noodles with shrimp ($1.39), sweet lotus paste buns (99 cents for three), deep fried shrimp balls ($1.39 for three), flaky purple pastries with sweet bean paste inside ($1.39 for three), egg noodles with fish balls in soup ($2.99), and wonton (a dumpling with pork and shrimp filling) ($2.99 and noodle soup ($2.99). The food was excellent. Normally, Chinese take-out is greasy, but this food was light. The noodle soup came in very large portions, enough to feed two people, and they put fresh you choy (a leafy Chinese vegetable) in the soup. 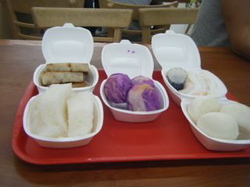 My favorite dishes were the turnip cake because usually at take-out places, the turnip cake is lumpy, but this one was smooth, and the purple pastry because the outside tasted like piecrust. I highly recommend the Yum Cha Café because the food is delicious and it’s very inexpensive. But ordering your food can take a lot of maneuvering. Most people show up at around 11, so it’s best to go before then. The crowd in front of the counter can be intimidating because everyone’s pushing each other and yelling in Chinese so it’s best if you try to jostle your way to the front of the line or bring someone who’s not afraid of crowds (like my mom). When you get to the counter, make sure you get the attention of one of the workers (who only speak a little English) by waving your hand in the air or no one will serve you. All of the food is laid out at the counter, so if you don’t speak Chinese point at the dishes you think look good. Make sure you know what you want because the workers will try to rush you to get through the line quicker. You have to find your own table, and if you order a bowl of noodles or something you have to wait for them to cook, they won’t bring it to you; instead, you have to go back to the crowded counter and get it your self. There are about 20 tables inside near the ordering counter. It can be hard to find a seat, so it’s good to have someone else with you so that they can claim a table while you’re ordering. Still, the food is well worth the hassle. Hours: Every day 8:30 a.m. a.m. to 8 p.m.